Bill Clinton received a Back to Godhead, an ISKCON World Review, and Bhagavad-gita As It Is from ISKCON devotee Kirtiraja Dasa while campaigning in Florida last fall. Kirtiraja also gave the same package to Mr. Clinton's running mate, Al Gore. Coretta King, wife of the late Dr. Martin Luther King, Jr., received a copy of the Gita from Kirtiraja while attending a celebration in Atlanta for Mahatma Gandhi's birthday. Other Gitas from Kirtiraja went to Ted Turner of Turner Broadcasting, Indian ambassador Kanwal Sybil, and former U.N. ambassador Andrew Young. Former Beatle George Harrison asked devotees to cater for the celebrities at their tribute last October to Bob Dylan. So at Madison Square Garden in New York City, while some musicians performed onstage, those backstage spoke with devotees and enjoyed delicious Krsna-prasadam. Singer Chrissie Hynde introduced George Harrison to the audience by saying, "Here's someone you all know the guy who's into Hare Krsna." Besides the twenty thousand people in the auditorium, twenty million more saw the concert on television and heard Krsna's holy name. The University of Maryland has appointed a Hare Krsna chaplain: Mrs. Kiran L. Sankhla. More than 1,600 students petitioned the campus ministry to ask that Mrs. Sankhla be made a chaplain, representing Krsna consciousness. The Reverend Sankhla, as she is known on campus, was welcomed by Dr. William L. Thomas, vice president for student affairs. He wrote, "I wish you tremendous success." An event still three years off calls for planning to start now, say the leaders of ISKCON in North America. The event: the centennial of Srila Prabhupada's appearance. Srila Prabhupada appeared in 1896. A three-day workshop in mediation trained devotees at the fall semester of ISKCON's Vaisnava Institute. The Institute programs took place at the Gita Nagari Farm, in eastern Pennsylvania. Psychologist Christina Cassanova led the workshop, assisted by Hemalata Dasi, a New York City clinical social worker. They showed how mediation can help solve problems that arise in human interactions. 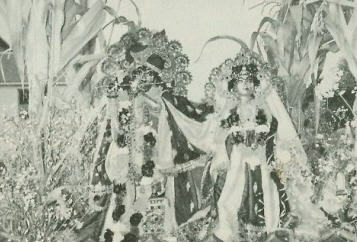 The Radha-Damodara Deities attracted more than a hundred devotees to a "family reunion" last fall. Radha-Damodara were the Deities of a party that traveled America by bus in the mid-seventies, putting on Krsna conscious festivals and passing out Srila Prabhupada's books. The reunion, held at Gita Nagari, brought together former members of the party, and other devotees who had been inspired to serve the Deities. Sunday School starts with a pizza party at the Hare Krsna temple in Brooklyn, New York, and it ends with a choice of four activities: drama club, Deity worship, mrdanga (drum) lessons, or classical Indian dance. Organizers of the Sri Sri Radha-Govinda Super Sunday School give kids three and a half hours of Krsna conscious fun while their parents attend the Sunday feast program in the temple. The kids also get classes on art, devotional chanting, and Bhagavad-gita. The Jewish "Oy, Philadelphia" festival mixed with ISKCON's Jagannatha Rathayatra festival last summer on South Street. The city had mistakenly issued permits for both festivals. No problem, said Arie Upfalow, an organizer for the Jewish event. "It was great. I've never seen anything like it." BTG columnist Yamuna Devi toured the United States last October and November to talk about her new cookbook, Yamuna's Table. Her tour included cooking demonstrations, book signings, and more than twenty interviews for radio, television, and newspapers. An audience of about twenty thousand heard BTG columnist Hare Krsna Devi Dasi on early-morning radio. In November a live show in California called her at her home in Maine for forty minutes of talk about the land, the cows, and Krsna. Wallace Dorian, the host of the show, has been practicing Krsna consciousness for thirteen years. Georgian terrorists captured Armenian devotee Brutian Samvel as he traveled through Georgia in October. They sold him to Azerbaijani terrorists, who threatened to kill him. (Azerbaijan and Armenia are involved in an ethnic conflict over disputed territory.) Then, surprisingly, the Azerbaijanis called ISKCON's Moscow temple to tell the devotees they had Brutian. ISKCON leader Niranjana Swami faxed a letter direct to the president of Azerbaijan, asking for Brutian's release. Niranjana Swami explained some basic points of Krsna consciousness. Brutian's presence in Georgia had nothing to do with politics, he said. Brutian was released that same day. He is now back in Moscow. 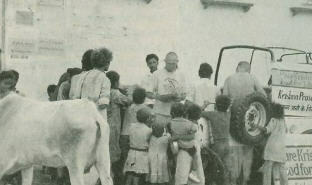 A local military commander helped devotees set up a Hare Krsna Food for Life program in Sukhumi, Georgia. He got them a government kitchen the only one left intact after shooting and disorder in Sukhumi, which has suffered violence and economic woes since the breakup of the Soviet Union. The Food for Life program every day feeds 300 to 400 people, many nearly starving. Private companies have sent donations, and the state ministry of internal affairs sends money directly into ISKCON's bank account, to feed officers, soldiers, and prisoners. Because of a fuel shortage, the military gives free petrol for the devotees' vehicles. The government of Belarus has given ISKCON 304 acres of farmland outside Minsk. The devotees have moved their cows from Minsk to the farm. They plan to start building a temple and planting a seventy-acre garden in the spring. Oslo temple president Tilakanatha Dasa visits about four schools a week, presenting Krsna consciousness to students in their mandatory religion class. So far he has visited more than 250 schools. That's half the schools in Norway. Radio Krsna has been broadcasting from the Oslo temple since 1984. It reaches about sixty miles, with a potential audience of one million listeners one fourth of Norway's population. Devotees give out prasadam, food offered to Krsna, at the front gate of Jaipur's Radha-Govinda Temple, one of India's most famous temples. Once a week, about eight hundred people receive a plate of kicchri (a hearty split-pea-and-rice preparation) and sweet-rice pudding. ISKCON life members sponsor the program. Devotees in Mayapur, West Bengal, travel to towns and villages to put on Krsna conscious programs, at least one a week. Often, more than five thousand people attend. The biggest program last year was in Bashirhat 25,000 people. The devotees have a transportable festival chariot (ratha) with which to hold programs all over eastern India. Devotees have opened the "Hare Krishna Gift Shop" in the heart of Hubli, Karnataka, a city of about a hundred thousand. The store, run by Muralidhara Dasa, sells devotional items and Srila Prabhupada's books. You can reach the secretary for ISKCON's governing body at a new address: GBC Communications, P.O. Box 10279 (Ballyganj), Calcutta 700 019, India. Krsna consciousness has come to Taveuni, the third largest of Fiji's 320 islands. ISKCON has had a center on the main island, Viti Levu, since 1974. Devotees began traveling to Taveuni occasionally in 1990 to hold Krsna conscious programs, and now a solid group of about twenty people hold weekly programs. At a recent ceremony at the Lambhasa temple, on Vanua Leva, the second largest island, five Taveuni devotees received spiritual initiation from ISKCON leader Tamal Krishna Goswami. ISKCON's first fully accredited high school has emerged at the New Govardhana Farm in Murwillumbah, New South Wales. The Hare Krsna Hour airs on the radio every Monday in Sydney. A recent nine-program series: the complete Bhagavad-gita in English. 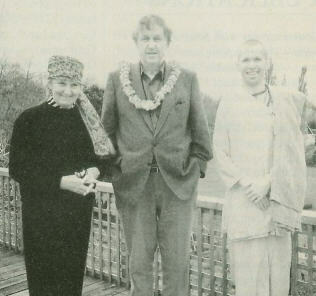 Sir Edmund Hillary welcomed two devotees to his home last fall. Sir Edmund, the first man to climb Mt. Everest, has served as New Zealand's High Commissioner to India, and he is deeply interested in Indian culture. He is also an advocate for protecting the environment. So he signed a letter encouraging New Zealanders to support the Padayatra, a walk organized by devotees to promote, among other things, a land-based economy and living in harmony with nature. A scientist from ISKCON's Bhaktivedanta Institute has completed a five-week lecture tour of schools, colleges, and universities in the three provinces of South Africa. The scientist, Rasaraja Dasa, visited fifteen campuses and gave more than thirty lectures. One professor called Rasaraja's talks "a breath of fresh air through the dusty cobweb of traditionalism."